There seems to have maybe been a caching issue where a new upload was still resulting in the download of an old file on the server. You'll know you got the old download if the separate Extended Introduction file wasn't also present. If you got the old file please delete the mod and redownload the main file!! I can't seem to get Varric to comment on the Inquisitors nickname is there a specific action I have to do? A place I have to go? Help, I am lost!!!!! If I don't want to have the ambiant tweaks effects, can I just disable them with the dai mod installer? Does anyone know if it'd be possible to add all companions to the "In Hushed Whispers"? Just have them all in their cells, without them joining the party, I mean. 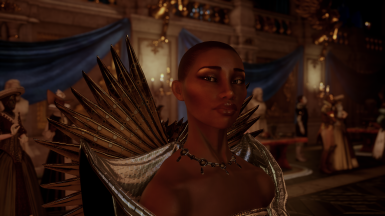 This mod only works because of the specific way the game loads your party members in Halamshiral, which is not the same as in Redcliffe, so unfortunately, no. It's a good, if somewhat soul-destroying, idea though. Only one romance cutscene will play, and which cutscene plays is picked from a static list. 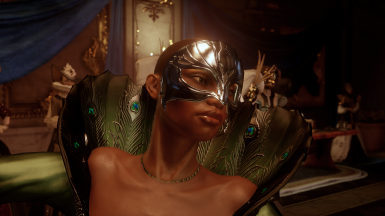 Josie is likely lowest priority bc you also get her on a non-romance, but aside from that I'm not sure of the ordering. i'm curious about how you got celene's dress on her, though. 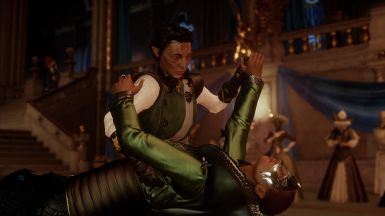 I was under the impression that non-party-member npcs had different outfit types than party members and the inquisitor and never have managed to get those npcs clothes onto party members, how did you do it?? It's because party members in hub areas like Haven/Skyhold/Halamshiral, when they aren't in your active party, ARE just normal npcs. It's not so much that the models comprising the outfits themselves are different, but that the game loads equipped armor and npc models via different systems (delay load bundles vs mesh variation databases) and never the twain shall meet. 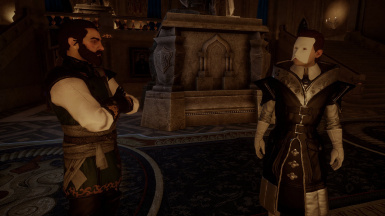 Ahh, that's interesting... does that mean you can swap what they wear in Skyhold, too? I could make a new version of my Live Like Whomever mod with the appropriate body, then. So there has to be a mesh variation database file that uses the same models as the unequipped ItemPartAppearance...? It turns out that the ItemPartAppearance files' DelayLoadBundleHashes seem to link to blueprints in the da3/actors/ folder which also contains all the models for companion armours and upgrades. wavebend informs me that this is to do with bundles. I'm sorry, but Mod Manager doesn't find the mod to merge... do I miss something? I cannot wait to try this mod out. 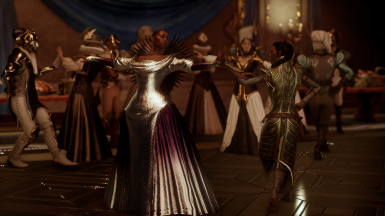 Party banter is one of my favourite parts of the Dragon Age series! Thanks for this! Good idea, considering they all act like they were there anyway.